An interesting and informative new look at eye- witness accounts of John Brown Raid, Trial and Execution. A must read. in Historical Fiction in Best Book Awards 2006" This historical novel provides eye-witness accounts of the John Brown insurrection from famous people like Robert E. Lee, from John Brown’s family, and from ordinary citizens like Margarette Brown and Christine Fouke. The information has been gathered by two of the raiders who escaped and live to tell about it -- Owen Brown, one of John Brown’s sons, and Osborne Anderson, a colored man. You will read about the preparations, the raid, the trials, the executions and the aftermath of the event. You decide -- was John Brown a hero or a scoundrel? The author has done an amazing job of telling an important, historically accurate account of John Brown's raid and trial. Actual letters from the trial accounts add to the authenticity. Historians, Civil War enthusiasts, and anyone interested in history of the abolitionist movement will gain much accurate information from this novel. Well done, Mr. O'Connor. Good luck and looking forward to future books. A Fan of historic novels. The Perfect Steel Trap is a great book about a key event in the time leading up to the civil war. The author uses historical letters and articles along with his narrative to transform the reader back to the raid, trial and execution. An equally important part of the book is the way the author tells the story of the number of historically famous people, who were present at Harpers Ferry and Charlestown. I look forward to reading Bob O'Connor's next book. Living in the midwest, we seldom hear about events from the Civil War days, but I am very interested in that time period. I found "The Perfect Steel Trap" to be extremely interesting and informative to read. I couldn't put it down, and I was extremely sad when John Brown was hung. The characters were very real to me as the author used great detail in developing and presenting their role in the events of that time. I would highly recommend this book to anyone who loves history! Too many historical events are just a date that you memorized in school. The Perfect Steel Trap makes an important prelude to the Civil War come to life in a fascinating account of John Brown and his rebels. I had no idea of the role of John Wilkes Booth and Samuel Morse among others who played such a pivotal role in this uprising. A great read! I got to meet the author and was lucky enough to buy a signed copy. Not only did we discuss this book, but I learned some fascinating history on other historical issues such as the Lincoln assasination. I hope and can't wait for him to write another historical novel - one of the best I've read in years. Congratulations, Mr. O'Connor, job well done. I learned so much information that I had incorrect in my thinking - now I can't wait to go to Harper's Ferry! 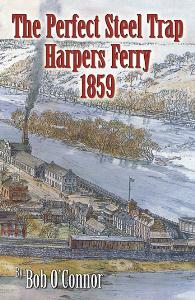 The events of Harpers Ferry in 1859 as dipicted in this book was very unique - the use of letters from people who were involved in some way and newspaper stories of the events. How Bob O'Connor was able to pull it all together into a fascinating chain of events kept me turning the pages for more. I wish John Brown wasn't hung but maybe the reaction to his death and his courage to die for his belief that slavery needed to be abolished was the "shot heard around America" for slavery. Well written book.